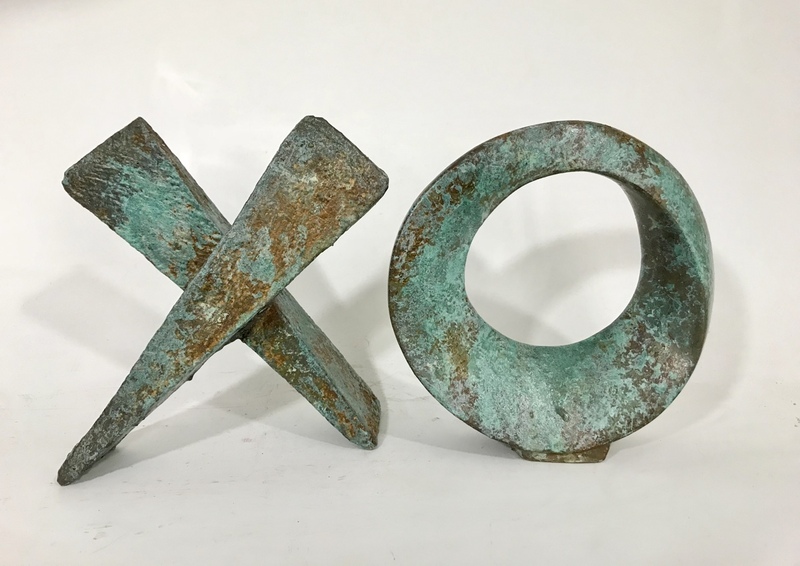 12" x 24" x 2 1/2"
In our current political climate of divisiveness, Love Letters is a powerful, iconic symbol, a monumental kiss and hug, that expresses a message everyone immediately understands; the universal theme of Love. This playful, giant kiss and hug sculpture generates a smile in all who see it. The Hug O ring is in an Infinity Ring. The contours that encircle the ring have no beginning and no end; the top side becomes the bottom side and the inside becomes the outside. Touch any edge of the ring with a fingertip and trace its contour. After going around two complete revolutions you will have traced the circumference of both the inner and outer contours of the Hug. X was an early antecedent of the acronym SWAK, “sealed with a kiss”, which became popular during World War I for soldiers to imprint on their letters to loved ones at home. In the Middle Ages, when few people could write, documents were sealed with an X, stamped in either wax or lead. Letters and books, as well as oaths of political and economic fealty between kings and their vassals, were “sealed with a kiss". Like all of my Infinity Ring sculpture and jewelry designs, Love Letters evokes ancient Feng Shui principles. The never-ending circular nature of its Infinity Ring form promotes infinite peace, love, abundance, healing, and serenity.